General Membership is open to any applicant who does not meet the requirements for Clinical Family Therapist or Professional Membership, but has some relevant training in the practice of family focused work. Applicants must satisfy the committee that they meet the criteria to be a General Member as determined by the Committee of Management. This Membership category is open to students, retired, non-practicing practitioners or those who have an interest and/or training in the practice of family focused work. A General Member is encouraged to align their practice with the AAFT Code of Ethics, however their practice is ultimately bound and adjudged by their own professional Code of Ethics or employer. 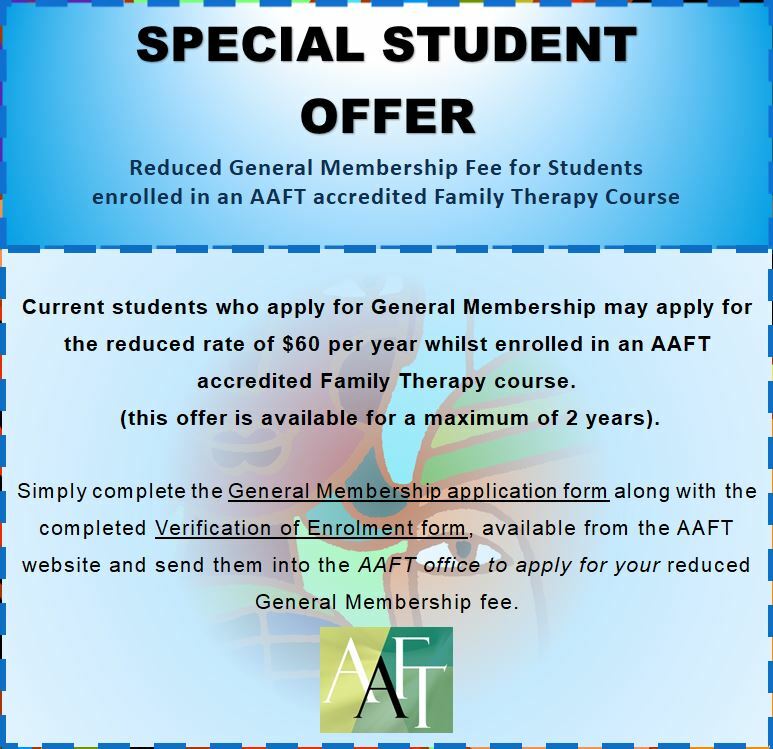 A General Member is not entitled to identify themselves as a “Clinical Family Therapist (AAFT)” or “Family Therapist AAFT”.